CALGARY -- Jake Virtanen knows a little something about the whole draft process. He's been through it once before. 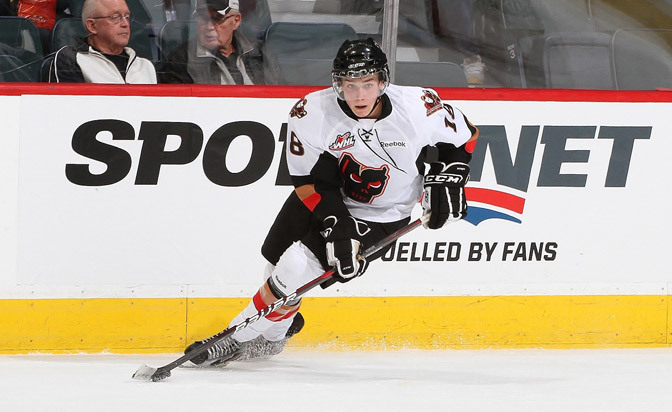 The Calgary Hitmen made Virtanen, NHL Central Scouting's ninth-ranked North American skater in its midterm rankings of players for the 2014 NHL Draft, the No. 1 pick of the 2011 Western Hockey League bantam draft. Virtanen said he feels that experience will help him navigate his way to the 2014 NHL Draft in June. "Obviously the Western Hockey League draft helped me out a lot," Virtanen said. "You had a lot of scouts and media just because I was the first pick. It's something you go through in hockey. Just doing interviews after games and with scouts too. It's nothing really new. "There are a couple new things but it's pretty much the same stuff. You've just got to answer questions. I have a lot of fun with it, meeting new guys and meeting scouts. I love doing that. It's a lot of fun." But there are dangers in a prospect constantly having to concern himself with the draft process, whether it is the WHL or NHL. And Hitmen coach Mike Williamson has watched as the 17-year-old has battled the pressure of the process in Virtanen's second go-round. "Jake's had a lot of attention for a lot of years so it's very important that he tempers those a little bit in two ways," Williamson said. "One, that he doesn't let the pressure get to him and two, he doesn't get carried away with himself and I think he does a good job of balancing that. He has to make sure he has to work hard and that he's a good teammate. Those are the things he's focusing on." And while Virtanen is focused on staying focused, scouts have kept their eye on the 6-foot-0.75, 208-pound forward. They've had plenty of opportunity to scout him. Playing in Calgary has given NHL scouts and executives plenty of opportunities to view the projected first-round pick. Sharing Scotiabank Saddledome with the Calgary Flames makes the Hitmen an attractive spot for eyes to perch. "It's kind of central," said Virtanen, who has 31 goals and 48 points in 48 games this season. "Most scouts will come here because it's central. Guys come from different places, not just Calgary. The eastern scouts come here and watch the western guys. It's good for me. It's good for the guys on our team. It's good for us. We're always here and the scouts are always here. It's the place to go for scouts. It's a lot of fun. "The exposure is really going to help me I think later on." But that exposure can go both ways, and over-exposure is something Virtanen's coach is well aware of. "Scouts get to see him probably more than some other players because of where we're at," Williamson said. "That can work for you or against you. They can see the positive things and they can pick your game apart. "For Jake, he knows there's going to be people watching him every game and watching some other players on our team. It's a great opportunity for him. He's got to continue to improve and continue to help us win and continue to develop his entire game and let things develop as they happen." One game in particular gave the hockey world a close-up on Virtanen. He and teammate Ben Thomas played on home ice in the BMO CHL/NHL Top Prospects Game, which featured 40 top 2014 draft prospects from the Canadian Hockey League in a showcase in front of a reported 250 NHL scouts, general managers and hockey executives. "Obviously it was amazing," Virtanen said. "With it being at the Saddledome, especially playing in front of the home fans, it's a huge honor. Then playing in front of the Flames fans, that was cool. I expected it exactly how it was supposed to be. I watched some highlights from previous years to see how it was and it was exactly like that. It was a lot of fun and a lot of good experiences." And while he didn't record any points in Team Orr's 4-3 victory against Team Cherry, Virtanen still found a way to open eyes. He was named the top performer in the on-ice testing process, a variety of drills designed to measure speed, agility and reaction time, among other attributes. According to data released by Sport Testing, Virtanen had the highest overall grade from the on-ice tests. Among the highlights was his top time in the 30-meter forward sprint at 3.92 seconds, as well as the top time in the 30-meter backward sprint, 4.55 seconds. "On-ice testing, I did pretty good in that," he said. "It was kind of funny. I wasn't really expecting that [backward] one, but I won that and I think skating is probably my biggest asset so I just used that to my ability and it'll help me later in my [hockey] life."